Corpse Party has been regarded as one of the goriest and scariest franchises ever since its PlayStation Portable remake. Despite it’s humble RPG Maker roots, the series was able to creep out players thanks to great artwork and vivid descriptions of deaths. 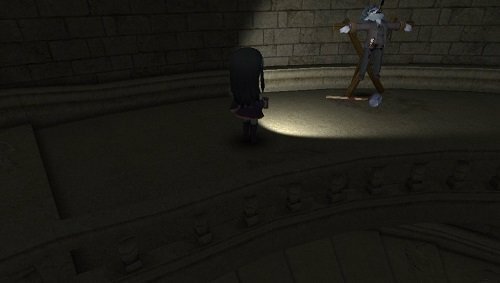 After toying around with being a point-and-click adventure game in Book of Shadows, the series has made the jump to 3D gameplay and models in Corpse Party: Blood Drive. Has the series lost something in the move to 3D? The short answer is yes. Corpse Party: Blood Drive has one major failing, its 3D art style completely belittles any scary moments. Since all of the characters are represented by cute chibi-style characters, it’s more funny than disturbing when you see one stabbing itself with a pair of scissors. Another failing is that the 3D models don’t change with what’s happening in the story. For example, a character in the game ends up losing an eye at some point, yet their on-screen model still has both eyes fully intact. This kills any sense of immersion, and belittles the entire scene that came beforehand. The detailed 2D artwork seen in previous games is also used less, with more scenes being played out in strictly 3D. 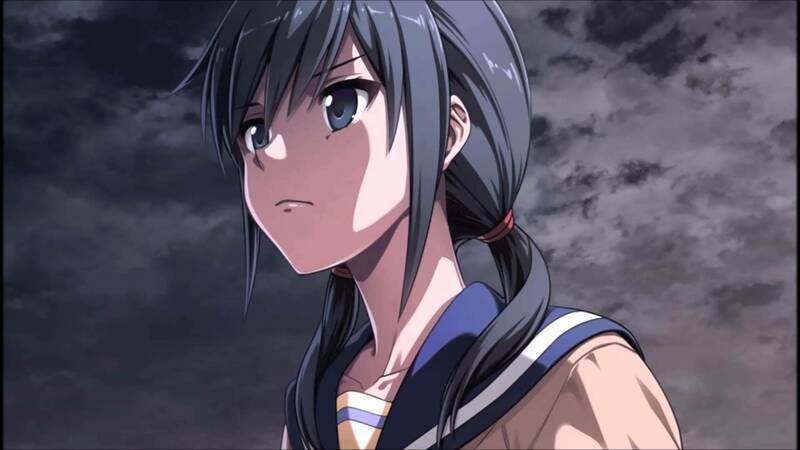 Once you get over that the art style completely clashes with the game’s goal of being spooky, you’ll find a very interesting story in Corpse Party: Blood Drive. The events from Book of Shadows has led to our protagonists still searching for a way to bring their friends back to life. This eventually leads to another trip to the Heavenly Host Elementary School, the same school that was thought to have been destroyed. To take advantage of its 3D gameplay, Corpse Party: Blood Drive now offers up full movement around the school. Players are no longer locked to a directional grid, and will have to carefully navigate the dangerous hallways. Different types of hazards such as tripwires are all over the floor, so there are many ways for players to take damage while just moving around. Oh, and there are undead spirits that will chase after the player if they are spotted. There are only two ways to deal with these supernatural enemies, and that is either by using talismans or successfully running away. As noted before, running away can be dangerous, and you only have a limited amount of stamina. Most of the game is spent going to specific rooms to trigger events, or solving pretty basic puzzles. The only problem is that you often are not given any direction to go on. This leads to a lot of wasted time by exploring every room until you eventually stumble into the area that will start a cutscene. This sort of trial and error can be frustrating, especially since there isn’t an easily accessible map of the school. The good news is that players will eventually get used to the layout, and the frustration of being lost will be gone. But even then the gameplay never manages to be the driving force behind Corpse Party: Blood Drive. I was never excited about playing the actual game, I largely just wanted to see what would happen next in the story. Thankfully, the storytelling is where Corpse Party: Blood Drive fully succeeds. While it does get needlessly complicated at times, I always wanted to see what would happen next. The constant plot twists kept me on the edge of my seat at times, and the character’s dialogue was all well written. Blood Drive is a really fun game to read through, it’s just too bad that it isn’t as fun to play. As stated before, the transition to 3D hasn’t been seamless for developer Team GrisGris. Corpse Party: Blood Drive has an embarrassing amount of technical failings. The most noticeable is the constant loading screens that players will see constantly. It’s acceptable that the game has to load whenever the player goes into a room of the school, but what isn’t acceptable is a lengthy load time every time you go to the game’s menus. Yes, if you want to pause the game or view your inventory, you have to sit through a loading screen. What’s even worse, is that once you select an option in the menu you are greeted with another loading screen. Exiting out is just as frustrating, as you have to sit through one loading screen just to watch one more. The amount of loading screens is atrocious, and considering you have to use the menus to heal your player they are completely unavoidable. The other area where Corpse Party: Blood Drive fails is in its frame-rate. The game gets very choppy depending what is on-screen, especially when multiple enemies are involved. These problems are further exasperated whenever the player’s flashlight is on, as the advanced lighting further impales the struggling game engine. If you’ve played previous entries in the series and want to see where the story goes, then Corpse Party: Blood Drive will be a worthy purchase. It’s just a shame that the actual gameplay ends up being underwhelming, and the art style prevents anything from being frightening. Blood Drive could’ve been something special, but a general lack of polish really hurts the overall quality of the product. Existing fans will still have a good time, just be ready to see the same load screen hundreds of times.